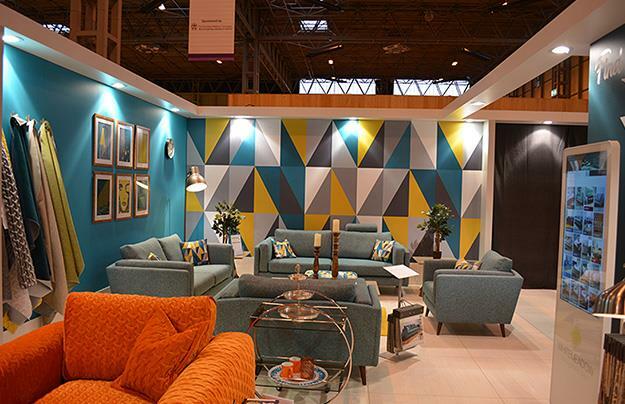 To supply and install large scale, high quality images, up to 8 meters wide and 3 meters high, to all walls of Whitemeadow’s exhibition stand at the January Furniture Show, at the NEC. These were then to be reused after the exhibition in their showroom. We printed direct to 5mm Foamex panels on a flatbed digital UV inkjet printer, splitting the larger images into manageable sizes for both site installations. We applied Velcro to the rear of the panels, which allowed us to seamlessly fit the panels to the walls of the exhibition stand, remove the panels at the end of the show, and re-install them in their showroom. This process is ideal for graphics that are to be reused again and again. “We couldn’t be happier with the graphics created for large our exhibition stand. The clarity and quality of the images was perfect, even on the larger scale prints. Installation was done by the StandOut team who carefully put them together in a way that allowed us to reuse the graphics afterwards in our own showroom. We received tonnes of compliments on the quality and look of our stand (Also done by Stand Innovations) and the graphics played a major part in creating our desired look” – Daniel Oscroft.